When a garage door opener begin to malfunction, it can cause a wide range of inconvenient and potentially even dangerous problems. These can consist of annoying issues like excessive squealing or rattling noises, or your door flat out 'refusing' to open or close. Your motor unit houses important features that can compromise your personal safety when they malfunction. That’s why it’s essential to make sure the unit is able to function reliably and consistently. 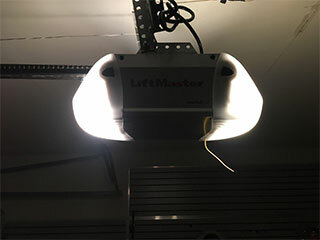 Like any complex machine, a garage door opener requires regular maintenance to ensure that problems aren’t developing. Our team will thoroughly check for signs of wear and tear, corrosion and damage. We'll clean and lubricate the drive system (if you have a chain or a screw type model), and replace any component we find to be beyond saving. Regular upkeep extends the service life of your unit considerably, and is an essential part of preventing breakdowns and accidents. Even the best-maintained opener could malfunction every once in a while, and our team will be there to help when this happens. We can replace broken and worn-out motor gears, as well as damaged chains and torn belts. If the rail or trolley have been damaged, we can fix those as well. If you’re not sure what the problem is, that’s fine; our team will be able to quickly troubleshoot the issue, trace it to its root cause, and provide a suitable solution for it. Sometimes the best thing you can do is to invest in a new opener. Modern units come with many benefits, such as improved security, ease of use and safety features. Our technicians will help you to pick out the perfect opener for your home. We work with famous brands like Genie, Linear and LiftMaster, and once you've found the right model for you, we’ll install it to our high professional standards. Our team can help solve any problem, whether it involves the circuit board, the motor, the safety sensors or any other part of the opener. Get in touch with our team at Garage Door Repair Newberg today and our experts will help you with whatever you need.